When hitting the "sell" button makes the most sense. A few months ago, I threw in the towel and finally sold out of my position in a company whose main product still gets tons of use in my house. It wasn't a happy financial decision: I took a 53% loss on the shares, which I had owned for more than two years. I didn't sell my SodaStream (NASDAQ:SODA) stock to raise cash for other investments or because I wanted to rebalance my portfolio. Instead, I decided that my investment thesis didn't apply anymore, that the business in its current state wasn't something I wanted to own over the long term. Here are a few reasons why I'm glad I sold this at-home carbonated beverage specialist. After being smacked by what management called a "landslide shift" away from carbonated soda drinks, sales growth hit a wall in fiscal 2014. For the four consecutive years prior to that, SodaStream's revenue soared at a 43% compound annual rate. Since then, sales have dropped for the past two years, by 9% in 2014 and by 19% last year. 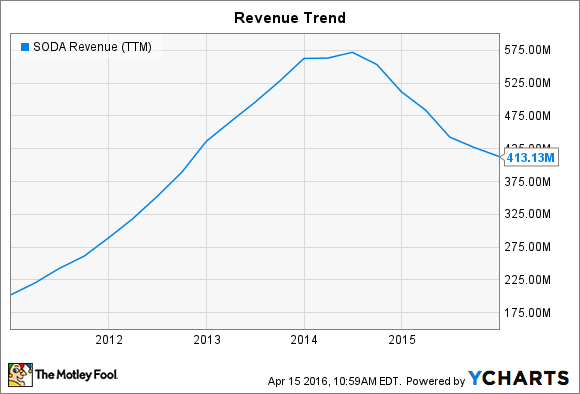 SODA Revenue (TTM) data by YCharts. More than a year into a transformation initiative that aims to relaunch the brand around sparkling water rather than flavored soda, things aren't looking much better. Sure, overall revenue was flat over the holiday quarter (on a constant currency basis). But starter kit sales, the metric that shows whether SodaStream's customer base is growing or shrinking, isn't improving. In fact, the company sold 24% fewer kits over the holiday season, compared to a 22% dive the prior quarter. 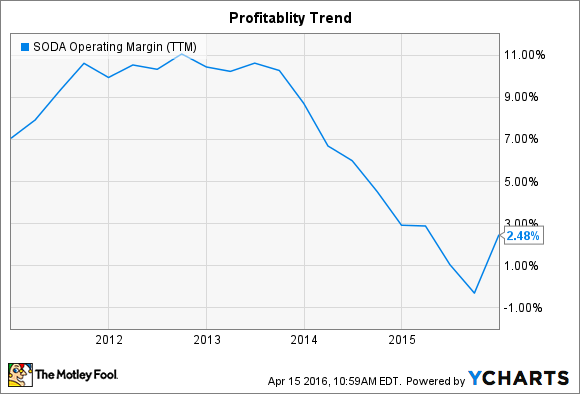 An improving profit margin trend is nice to see for any business, but for SodaStream's operations, it's even more important for profitability to tick higher over time. Its business operates on a razor-and-blades model, which requires building up a large base of customers through beverage machine sales and then selling carbon dioxide canisters to those customers. Since CO2 containers are more profitable to sell, gross margin naturally rises in mature markets where canister sales are a higher proportion of overall revenue. Profitability can also rise if beverage machine sales tank while CO2 sales hold steady, which is what is happening in the business right now. SODA Operating Margin (TTM) data by YCharts. CEO Daniel Birnbaum and his team deserve credit for slicing costs, reducing overhead, and creating a leaner operation over the last two years. Yet it's unclear how, even at a lower cost structure, SodaStream can return to its past glory of consistent double-digit profit margins. Ultimately, though, I just don't buy the turnaround plan that SodaStream is pursuing. It's running away from the "soda" part of its brand and toward a sparkling water concept. The idea is that, even as carbonation machine sales have been plummeting, the user base has stayed happy with the product, as evidenced by increasing deliveries of CO2 containers. I'm one example of that process at work, as I'm using more canisters at home now than I was a year ago. These engaged customers are good news for the business outlook for two reasons: (1) They show that consumers haven't abandoned the at-home beverage making concept, and (2) They constitute a base of happy customers that can be sold on new and improved products. As Birnbaum put it last November, "We believe usage rates will continue to grow as existing and new consumers embrace our repositioning as a healthy water brand." SodaStream has reinvented its starter machine kits, reimagined its flavored syrup offerings, changed its branding, and transformed its marketing, but there's no evidence that the change is resonating. Except for the fact that it has the same name, customers might not even recognize today's company compared to the one that was threatening to disrupt the established soda giants just a few years ago. In the same way, SodaStream, the investment, looks far different right now. It's a risky turnaround bet on an unproven concept, and that's not what I signed up for.